The editors of LINKS Magazine compiled a list of special experiences and practices that we think mark the members of our tribe as being just a little off from normal. 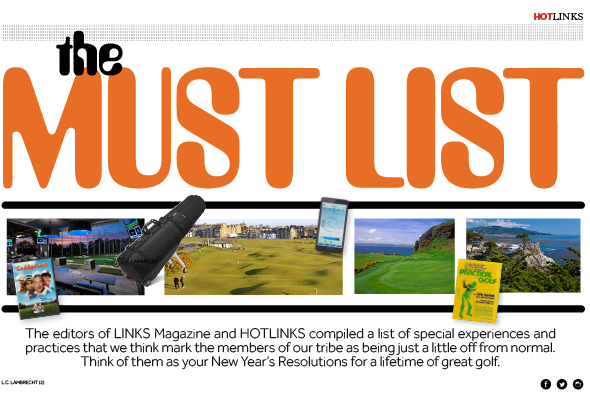 Think of them as your New Year’s Resolutions for a lifetime of great golf. Preferably each year. Because life is short. Watching a tournament on TV is more entertaining if you’ve played the course. You get a better feel for the shots the pros are facing if you’re familiar with the routing, topography, and green complexes, all of which get flattened on screen. You can’t learn how to play, or how to play better, from a magazine or book. Regular work with a pro who knows you and your game is the secret. The iconic status given to golf’s historical figures can make them seem like fictional characters. So it isn’t until you pass Old Tom Morris’s childhood home on the way to his grave—underneath the cathedral ruins in St. Andrews—that the forefather of modern golf course architecture becomes a real person. You’ll also have a new appreciation for the Cradle of Golf as a real town, not some sort of museum. Trade the awkward glances received when walking into a golf club looking like a walking yard sale—with shoes, clothes, and clubs draped over your arms—for a suitably handsome carry bag. All the better if it’s embossed with a famous club logo. Particularly the Eden, New, and Jubilee. Most locals believe if those three were anywhere else in Scotland, they’d be considered classics: Eden is the most fun, New the most quintessentially links, Jubilee the longest and hardest. 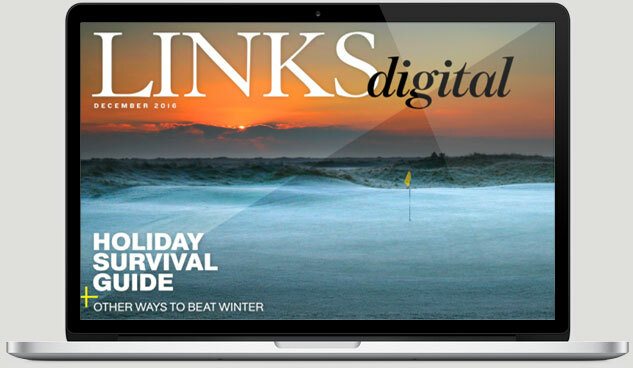 Taken together they offer a crash course in links golf perfection. No one remembers how you played but they do remember how you behaved. The memories of the meal will last almost as long as your memories of playing No. 2. This fabled road through the Del Monte Forest on the Monterey Peninsula twists and turns past Pebble Beach, Cypress Point, and a host of other California classics. The views of the Pacific scenery are pretty spectacular, too. Next time you’re in Scotland, make your way to the Isle of Arran (a short ferry ride from the west coast) and play the best 12-hole golf course in the world, Shiskine. A pure links set amid spectacular scenery, it’s also the most quirkily charming course you’ll ever play. 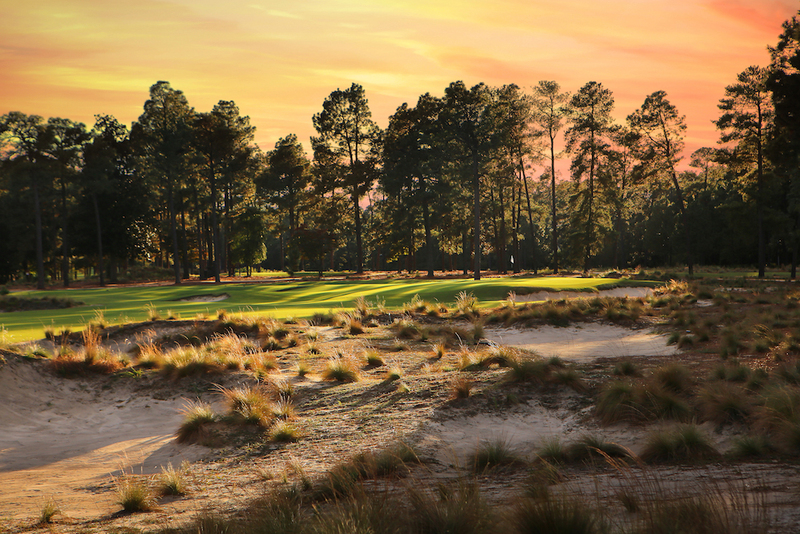 One hole has two flagsticks, another features a stoplight, another a bell—but every hole is worth the trip. Those guys really are good. If every newcomer to the game could begin by reading this book, handicaps worldwide would plummet. Jacobs did what no teacher before him ever had—he boiled golf down to a set of ball-flight laws, explaining how face angle, swing path, and angle of attack combine to spin the ball and produce shots. Understand those simple laws and you’ll have a huge head start on understanding the game. Most golfers tend to be either morning or evening people. The former go for the dewsweeper tee times, the latter love to play in with the setting sun. If you’re a morning golfer, just once go the other way—book the last time of the day and enjoy the glories of golf in the gloaming. Likewise, you slugabeds should give the dawn patrol a shot: Find yourself the first tee time somewhere and savor the joy of pristine conditions and an entire course wide open in front of you. If you take your clubs on the road, a sturdy wheeled travel bag is a no-brainer. For our money, the two best manufacturers are ClubGlove and Sun Mountain, both of which offer numerous sizes, constructions, and colors. ClubGlove is the Tour pros’ choice, while Sun Mountain has a patented design with a second set of retractable wheels that makes it easy to transport clubs—and whatever else you’ve stuffed in the bag. There’s a saying, “the longest hundred yards in golf is the walk from the practice range to the first tee.” A great way to shorten that trip is by taking a playing lesson with a PGA professional. You’ll not simply learn some new moves, you’ll be able to pressure-test them by hitting to real targets while getting instant feedback from your playing companion. At the same time, a good pro will help you sharpen your management skill—the ability to use your strengths and work around your weaknesses to negotiate the course more efficiently and effectively. Even if you’ve never been to the tournament yourself. But only if you want the game to outlive you. 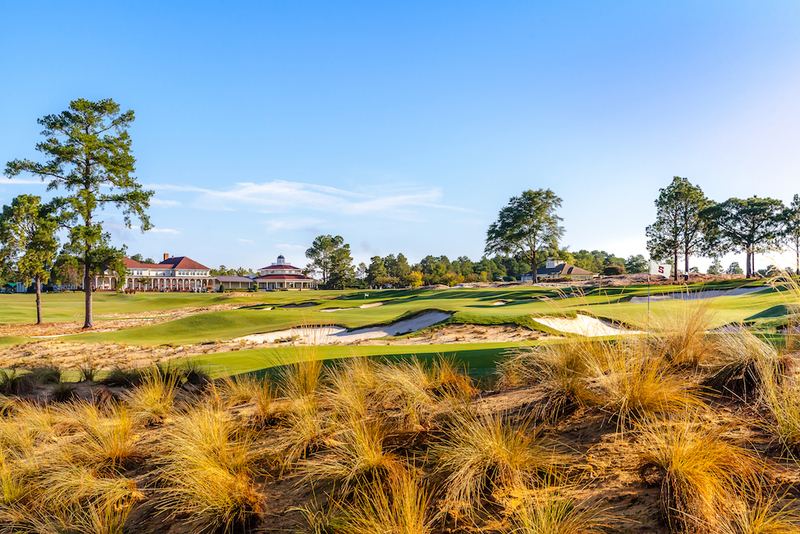 The USGA has made a concerted effort the last few years to hold our national championship on courses open to the public, so you’d be a fool not to see what they like about the likes of Chambers Bay, Erin Hills, Pinehurst No. 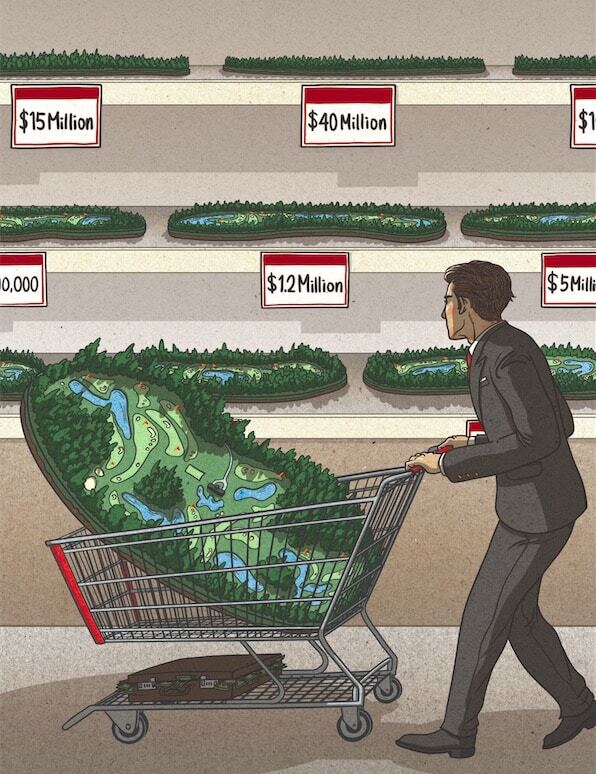 2, Bethpage Black, Torrey Pines, and, of course, Pebble Beach. But don’t play from all the way back: If you’ve watched any recent Opens, you’ll know those tees can be too hard even for the pros. And pray that you’ll rarely need it. Hickory golf is gaining in popularity with numerous societies and tournaments in place around the world, authentic clubs easily obtainable via the internet, and hickory courses near Bandon Dunes and The Greenbrier in the U.S., and St. Andrews in the UK. But the ultimate experience is surely the Old Course at Musselburgh, Scotland: One of the original Open Championship sites, its nine holes are surrounded by a race track. Or not. Just fix them. And give it another chance. Even if you consider yourself a traditionalist, there’s a lot to learn and enjoy from high-tech golf gadgets. Swing analyzers like Epson’s M-Tracer, Swingbyte, Zepp, Arccos, and Golf Game use your smartphone to help you play better. Scoring apps like VPAR, GameBook, and GolfLogix can track your games, bets, and progress. And even if the difference between a 145-yard and 148-yard shot doesn’t mean much, rangefinders and GPS devices can speed up play and help your confidence. But in the end, you still have to hit the shot. You’ll like it. We promise. More importantly, how to take it.